The race track is both the best and the worst place to test cars. Before you can begin to test a car on the tarmac, the track is already testing your ego. So, even if you get on to the track with a honed instinct to understand the car at hand, you have subliminally let that take a back seat by the time you are tackling the first corner. Often, it is a fight to keep the challenge going even as you weigh both your and the machine’s limitations. That is exactly how it seemed when I was peering through the windscreen of the new Baleno Rs. I was at the Buddh International Circuit, the F1 circuit in Greater Noida just a few hours after the official launch of the Baleno Rs. Maruti Suzuki’s first honest attempt at a hot hatch is barely track ready, but the race track doesn’t discriminate. It is up to the driver to avoid getting distracted and focus on the task at hand. I was shaken out of that distraction when I was into my third lap. By that time it was already clear that the Baleno Rs. is not really meant for the track, but it was such good fun nonetheless. 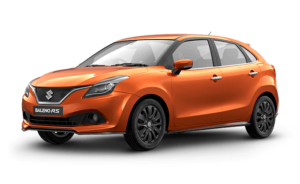 The Baleno RS doesn’t look vastly different from the Baleno, yet it has a distinct personality. Changes include a new front mesh grille in chrome, bold front bumper, underbody spoilers married with black sports alloy wheels, and the signature RS emblem on the rear door. While these changes give the car a rebel-like personality, the front mesh grille in chrome appears a bit too flashy for a car this sporty. Maruti hasn’t changed anything on the interior of the Baleno RS as compared to thestandard car. You still get the all-black dashboard with silver accents on the centre console and a large touchscreen that gets Apple CarPlay and Navigation as standard. The Baleno RS also comes with a torque/power output readout in the instrument cluster that is always a cool thing to look at (and try to max out) while driving. A sportier seat package or even leather interiors would have been welcomed by buyers – even if it meant spending a bit extra. And if not that, maybe a RS logo, or contrast stitching on the seats, or even red accents would have helped create a signature. The Boosterjet 1.0 is one of the two engines Suzuki produces in the Boosterjet series, the other being the more powerful 1.4 l unit. The 998 cc, three-cylinder engine on the Baleno RS is a direct injection turbo engine that produces around 100 hp of peak power and 150 Nm of torque. The Boosterjet 1 l engine is claimed to deliver 20 % more power and 30 % more torque compared to a regular 1.2 l naturally aspirated petrol engine. There are technical advances that enhance the performance quotient on the Boosterjet engine – at the core of the engine lie the direct injection system that delivers fuel at pressures of about 200 bar into the cylinders, giving the engine very efficient combustible air-fuel mixture that help reduce fuel consumption as well as emissions. In a DI engine, to quickly create an air fuel mixture inside the cylinder, the fuel to be injected must be atomised. Additionally, the shape of the intake ports and the pistons are optimised to generate a stronger tumble flow. The turbocharger, on the other hand, utilises the energy of the exhaust gases to drive the turbines and force feed the compressed air into the cylinders. The result is not only output equivalent to an engine of much greater displacement, but also high torque at low revs. The turbine runs at around 200,000 rpm and this result in an output that is equivalent to the output of a much larger engine, , explained CV Raman, Executive Director (Engineering), MSIL Some of the other highlights of the compact and lightweight engine include reduced friction timing chain, short port intake manifold, roller rocker follower with hydraulic lash adjustor, a dual relief oil pump, and integrated exhaust manifold. From a performance perspective, the first thing we noticed was the ease at which the engine builds power. There is no visible lag, as the engine revs quickly through to the peak rpm limit. We could push the car to a maximum speed of around 162 km/h on the back straight at BIC, and at all times NVH levels on the engine was refined, albeit with a constant humming, yet not-so-unpleasant noise. Transmission on the Baleno RS is the same 5-speed manual unit found on the regular Baleno hatchback. Now, the Boosterjet engine that is available globally delivers around 170 Nm of torque and 85 kW, or approximately 14 hp of additional power compared to the one launched in India. The engine has actually been detuned to cope with the poor quality of fuel available in our country at the moment. Most vehicles in India today run on petrol with octane rating of 91, while the European-spec Boosterjet needs to run on 95 octane rating petrol. One of the key parameters for petrol is the octane number, which essentially is a measure of its resistance to knock. SAFETY ; The Baleno RS has been launched in a single variant – Alpha – and it complies with top-notch safety norms. Dual airbags, ABS, seatbelt with pre-tensioners and force limiters add to the safety quotient of the car, which has been tested at the company’s R&D centre in Rohtak and meets future pedestrian safety, side impact and frontal offset impact regulations. Maruti Suzuki says that the Baleno RS is ideally made for the highways, where you’d love to cruise all day in three digits. And, the Baleno RS will easily maintain 90kmph at just over 2,000 rpm in fifth gear, and will willingly go into the 100s with a gentle tap on the throttle. It also crosses the 150kmph mark with ease, and highway runs in this car will be engaging for sure. As the Baleno RS gets a fatter band of torque and the gearing to make the most of it, it felt more comfortable at higher speeds as it was running at relatively lower revs. So, while the highway runs will be more exciting in the RS, it won’t be surprising if the Baleno RS turns out to be more frugal than the Baleno despite the added performance. There is a lot to like about the Baleno RS. It’s powerful, hugely spacious and by all means, a genuinely affordable performance hatch. The fact that it’s fairly efficient and backed by the most trusted brand in the business also helps its cause. However, it’s somewhat disappointing that Maruti hasn’t worked on the interior one bit and done little to spruce up the exterior look. So if you are after the boy racer looks and want your performance hatch to stand out, perhaps the Fiat Abarth Punto is a better choice but be prepared to fork out at least Rs 80,000 extra for it. As it stands, the Baleno RS is an understated performance hatch but in the larger scheme of things, an accomplished all-rounder, indeed.